We all know what wonders an occasional massage can do. The deep muscle-relaxation that a professional massage therapist can bring is almost unequaled. The Statesboro Thrives Wellness Center massage therapists are highly skilled and utilize different types of massage styles based on your individual needs. The benefits of massage can restore damaged muscles and the stress of accumulated from the everyday. We offer different styles of massage to treat different levels of muscle tension located in different areas of the body. The primary goal of the Swedish Massage is to provide relaxation for the entire body. This is accomplished by working the muscles with long gliding strokes in the direction of blood returning to the heart. Swedish massage is exceptionally beneficial for increasing the level of oxygen in the blood, decreasing muscle toxins, improving circulation and flexibility while easing tension. Deep tissue massage, also known as neuromuscular therapy, is designed to relieve pain and muscle tension throughout the body. This type of massage is extremely beneficial because it reaches the deepest layer of muscles, fascia and tendons. 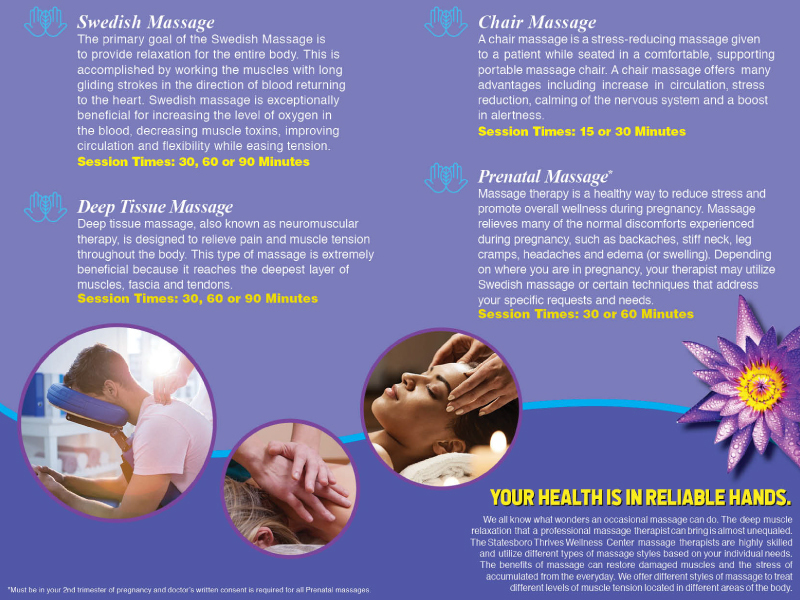 Massage therapy is a healthy way to reduce stress and promote overall wellness during pregnancy. Massage relieves many of the normal discomforts experienced during pregnancy, such as backaches, stiff neck, leg cramps, headaches and edema (or swelling). Depending on where you are in pregnancy, your therapist may utilize Swedish massage or certain techniques that address your specific requests and needs. *Must be in your 2nd trimester of pregnancy and doctor’s written consent is required for all Prenatal massages. A chair massage is a brief, stress-reducing massage given to a patient while seated in a comfortable, supporting portable massage chair. A chair massage offers many advantages including increase in circulation, stress reduction, calming of the nervous system and a boost in alertness. Session Times: 15 or 30 minutes. 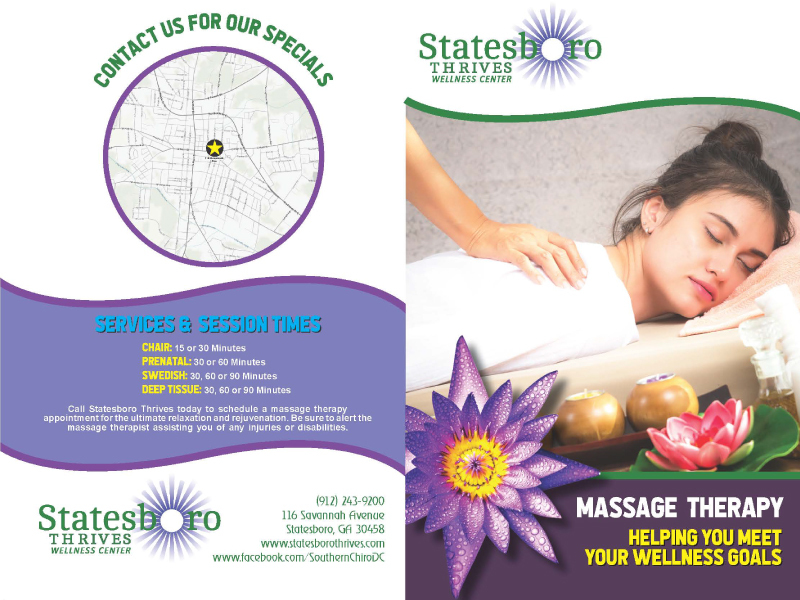 Call Statesboro Thrives today to schedule a massage therapy appointment for the ultimate relaxation and rejuvenation. Be sure to alert the massage therapist assisting you of any injuries or disabilities.